By God’s grace, not long ago we lived to see another Holiday of Holidays, the Bright Resurrection of Christ, Pascha. How I wish that all of you, parishioners of our churches and pilgrims who visit us who live in the Holy Land could also experience the divine services of Passion Week, participate in the burial service of Christ the Savior at the Live-Bearing Sepulcher of the Lord, be honored to receive the Holy Fire on Great Saturday, hear the peal of bells on Pascha night at the Church of the Resurrection of Christ, followed by the bells of all the Orthodox churches in the Holy City; to celebrate the Ascension of the Lord in our convent dedicated to the holiday on the Mount of Olives and visit Mount Zion on the day of the Holy Pentecost. We thank God for this joy, this blessing and great responsibility lain upon us who live, serve, pray and seek our salvation close to the wondrous holy sites of Jerusalem, while protecting and preserving the holy places we received from our honorable ancestors. And so it often happens that after the intense period of divine services and celebrations, and the welcoming of the multitudes of pious pilgrims, a calmer period comes upon us, when life resumes its regular pace, and one can rest and turn to the affairs of our beloved Mission. We just learned that an organization by the name of HALO Trust has initiated a program of de-mining the Israeli side of the Jordan River, near the site of the Baptism of the Lord, where the Russian Orthodox Church Outside of Russia acquired a plot of land in the 1930’s and built a chapel, which until the mid-1960’s was a destination for pilgrims seeking to immerse themselves in the holy waters of the Jordan. The place now contains thousands of anti-personnel mines and other ordnance. Ever since the late Patriarch Diodoros of blessed memory ascended the throne of the Patriarchate of the Holy City of Jerusalem and All Palestine, the traditional Great consecration of the Jordan River has been resurrected on the very site of the Baptism of the Lord near St John the Baptist Monastery, between the Dead Sea and Jericho. The problem is that after the Six-Day War in 1967, this holy place became a no-man’s-land and was covered with mines. 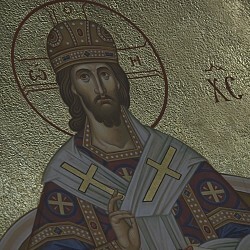 But Patriarch Diodoros was able to obtain permission from the Israeli authorities to have this site opened once a year. So after a hiatus of many years, Orthodox clergymen could once again bring their flocks, accompanied by Israeli soldiers who de-mined a path to the holy river, for the traditional Great consecration of the waters of Jordan on the Epiphany Eve. 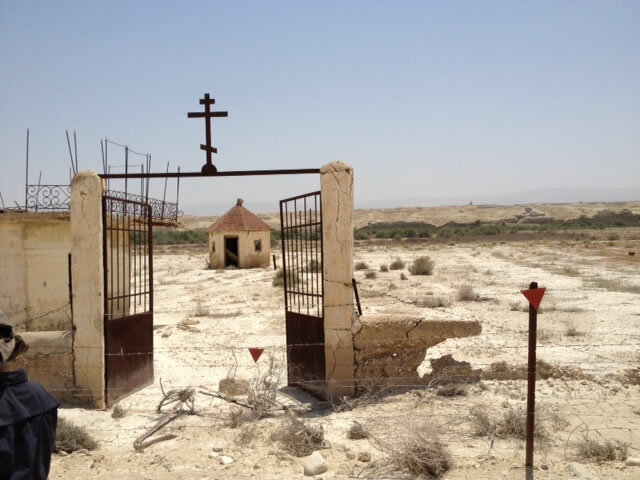 Every year this abandoned site has been returning to normal, and a few years ago the site of the Baptism of the Lord became accessible year-round. Now, hundreds of pilgrims come here every day. Also, from the Jordanian bank of the river, a Russian Pilgrims’ Center was built a few years ago by the Moscow Patriarchate with a splendid church where pilgrims from the CIS pray and immerse themselves in the Jordan River, and proceed to visit other holy sites in Jordan. Unfortunately, not all pilgrims who visit the Holy Land can cross into Jordan. HALO is the acronym for Hazardous Area Life-Support Organization. HALO Trust is a charitable non-profit organization which de-mines territories and removes unexploded bombs which present a danger to peaceful civilians. Members of this organization have worked in Nagorny Karabakh, Cambodia, Mozambique, Somalia, Sri Lanka, Eritrea, Abkhazia, Chechnya, Kosovo, Angola and Afghanistan, defusing and removing tens of thousands of mines and live explosives, restoring normal life for the local populations. With the gradual, and very difficult, de-mining of this site, consecrated by the asceticism and tears of the Forerunner of the Lord John, St Mary of Egypt and many hermits, access will be opened to our Mission’s parcel, which will allow us to expand, with God’s help, our service in the Holy Land. For the duration of the existence of our Ecclesiastical Mission, the brethren and sisters of the monasteries have seen and endured all sorts of troubles, tribulations and sorrows, but the merciful Lord always preserves His own. And now we sense that the Lord calls upon us to increase our efforts to His glory and for the good of mankind. That is why, I hereby appeal to all of our dear parishioners, worshipers and pilgrims to support this excellent project, and the Russian Ecclesiastical Mission in Jerusalem, to help us continue to work entrusted to us by our predecessors. We would be deeply grateful if our pilgrims found it possible to make a contribution to HALO’s project, donating funds directly to them, or through our REM of the Russian Church Abroad in Jerusalem. Russian Orthodox Church Outside of Russia.